This event is free to SCHS members and $5 for non-members. Children under 18 are free. Ample onsite free parking is available. Wayne Armstrong is a professor emeritus in the Life Sciences Department at Palomar College in San Marcos, California. 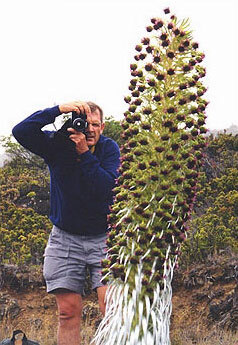 He is also the botanical consultant for the Palomar College Arboretum and editor of the quarterly Aboretum newsletter. His research interests include the taxonomy of duckweeds (family Araceae, subfamily Lemnoideae), California floristics, fig pollination, tropical drift seeds, and natural seed jewelry. He has published more than 200 articles in various natural history magazines and is the author of the popular web site Wayne’s Word, an on-line textbook of natural history, with more than 9,000 images.